Unless you’ve been living under a rock (or you know, sailing through remote islands), you’ve likely heard of essential oils. I’ve always been intrigued by them, but also quite skeptical. I’m not one to fall for hype. I like to do my research and see what all the fuss is about. I finally broke down and bought myself The Complete Book of Essential Oils & Aromatherapy after a few recommendations from the ladies of Women Who Sail. While a lot of it is a bit dated, the bones are good. It explains what each oil is good for, all the different ways to use them, and the remedies for specific ailments. That coupled with a little googling and I was ready to try a couple recipes. The first one I tried was an All-Purpose cleaner recipe. The only ingredients the recipe called for were vinegar, water, borax and essential oils. I made mine with lavender and lemon. 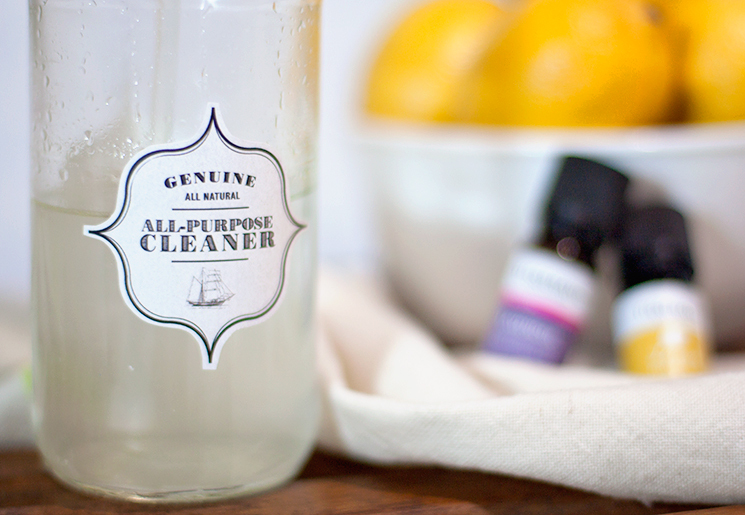 Lavender apparently has magic powers, and lemon is a good antibacterial addition. In the end, I just know that this stuff works. I decided to cut the recipe in half in case I didn’t end up liking it. That way, I wouldn’t waste precious ingredients. Essential oils aren’t cheap! After I made my batch I did a serious deep clean of the galley. It literally took me all day long. The worst part was it looked exactly the same as it did before I started. I like to think I keep my galley pretty tidy, so I’m not surprised, but it would have been nice to have that animated sparkle that commercials always seem to have. It sure did smell better though. So fresh and so clean, clean. No toxic chemical smell for this boat! To package my new fancy cleaner, I used an old apple cider vinegar bottle and the sprayer from a bottle I already had. Apparently essential oils can eat away at a plastic spray bottle. I should have used a darker glass bottle (I guess light isn’t good for the oils? ), but in true cruiser fashion this is what I had on hand so I made due. And because sometimes I let Pinterest get the best of me, I had to make my own label so all the people who come over to my boat to clean don’t get confused as to what is in the bottle. Inspired by these cool vintage apothecary style labels, I tweaked and made my own version. I LOVE how they turned out! I printed them out on a standard mailing label and cut them to size. They aren’t coated, so in about a day I’m sure I’ll grab the bottle, sponge in hand and smear all the ink. Who cares though, at least they look cute now! I also tried my hand at a linen spray. I’m not thrilled with this one. The scent doesn’t really stay on my sheets. I’ll keep searching for a recipe I like. 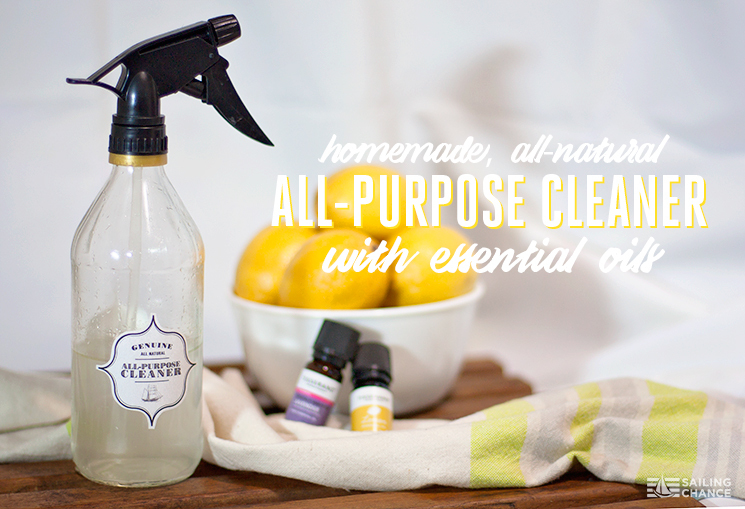 But, for now I am loving knowing that the products I’m using to clean my home are non toxic. Baby steps to a healthier 2016! Do you have any essential oil recipes you love? Send them my way! Thanks for the great advice! Sweet-smelling and natural are so much better than “industrial clean.” My question: did it really clean the galley? You said it looked exactly the same, but maybe it looked clean before you started, eh? That recipe seems like a good one to get things really clean. Anyway, nice to hear about your success. Now I’ll try to find borax.